UPDATE: Our sister site, Huffington Post UK, is liveblogging developments from the hacking scandal. Pressure is growing on both the government and News Of The World Editor Rebekah Brooks. Huffington Post's Michael Calderone looks at what this scandal could mean for media mogul Rupert Murdoch. LONDON - Britain's phone hacking scandal intensified Wednesday as the scope of tabloid intrusion into private voice mails became clearer: Murder victims. Terror victims. Film stars. Sports figures. Politicians. The royal family's entourage. Almost no one, it seems, was safe from a tabloid determined to beat its rivals, whatever it takes. 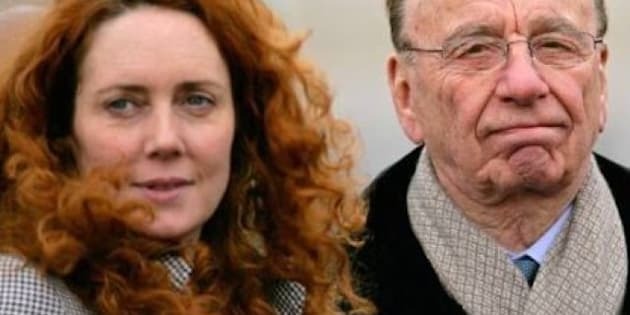 The focal point is the News of the World — now facing a spreading advertising boycott — and the top executives of its parent companies: Rebekah Brooks, chief executive of News International, and her boss, media potentate Rupert Murdoch. In his first comment since the latest details emerged, Murdoch said in a statement Wednesday that Brooks would continue to lead his British newspaper operation despite calls for her resignation. The scandal, which has already touched the office of Prime Minister David Cameron, widened as the Metropolitan Police confirmed they were investigating evidence from News International that the tabloid made illegal payments to police officers in its quest for information. The list of potential victims also grew. Revelations emerged Wednesday that the phones of relatives of people killed in the July 7, 2005, terrorist attacks on London's transit system, as well as those tied to two more slain schoolgirls, may also have been targeted. The true extent of the hacking is not yet clear — and may not be known for months as inquiries unfold. Graham Foulkes, whose 22-year-old son David died in the 2005 terrorist attacks, was told by police that he was on a list of potential hacking victims. "I just felt stunned and horrified," Foulkes told The Associated Press. "I find it hard to believe someone could be so wicked and so evil, and that someone could work for an organization that even today is trying to defend what they see as normal practices." Foulkes, who plans to mourn his son on Thursday's sixth anniversary of the attack, said an independent investigation is needed because the police were compromised by accepting payoffs from the tabloid. "The police are now implicated," he said. "The prime minister must have an independent inquiry and all concerned should be prosecuted." Foulkes also demanded the resignation of Brooks, the former News of the World editor who is now chief executive of News International, the U.K. newspaper division of Murdoch's News Corp. media empire. News Corp. owns a swath of newspapers, including News of the World, the Sun, and the Wall Street Journal. "She's gotta go," Foulkes said. "She cannot say, oops, sorry, we've been caught out. Of course she's responsible for the ethos and practices of her department. Her position is untenable." Brooks, one of the most powerful women in British journalism, maintains she did not know about the phone hacking. She said she will continue to direct the company. Foulkes also challenged Murdoch — a global media titan with newspaper, television, movie and book publishing interests in the United States, Britain, Australia and elsewhere — to meet with him to discuss the intrusion into his privacy. "I doubt he's brave enough to face me," he said. In Parliament, lawmakers held an emergency debate to call for the prosecution of those responsible for hacking into the phone of Milly Dowler, the 13-year-old murder victim whose case touched off the scandal, and others. The Dowler case touched a raw national nerve because the paper is accused of hampering the police investigation by deleting some of Milly's phone messages, which gave her parents and police false hope that she was still alive after she disappeared in 2002. Cameron called for inquiries into the News of the World's behaviour as well as into the failure of the original police inquiry to uncover the extent of the hacking. Potential victims have cited the tabloid's payoffs to police as the reason the allegations did not surface earlier. "We are no longer talking here about politicians and celebrities, we are talking about murder victims, potentially terrorist victims, having their phones hacked into," Cameron said. "It is absolutely disgusting, what has taken place, and I think everyone in this House and indeed this country will be revolted by what they have heard." British media reported that the parents of two other schoolgirls, Holly Wells and Jessica Chapman, who were murdered in a sensational 2002 case, had been informed by police that they were investigating whether the News of the World hacked their telephones. "It's heartless and inconsiderate that they'd do it to victims and family of murder victims," said Danny Wright, 25, of Liverpool. He said it was wrong to hack into celebrities' phones but far worse to target victims' families "because of what they've been through." Bob Satchwell, executive director of the Society of Editors, said the Dowler case was crucial. "That's why the case has gotten so big," he said. "If celebrities or politicians have their phones intercepted, that's one thing, but the idea that they were doing this while a little girl was missing and a police inquiry was going on makes it a really gross intrusion." Satchwell said it has become politically sensitive not only because Cameron's communications chief Andy Coulson was forced to resign because of his earlier stewardship of the tabloid, but because lawmakers opposed to Murdoch's growing media power in Britain want to slow his takeover of other properties. He said the hacking of Milly's phone was revealed just as government regulators are preparing to decide whether Murdoch can take full control of British Sky Broadcasting. "You have to ask yourself why that happened right now," he said, cautioning that the public has yet to see clear evidence of illegal phone hacking except for two News of the World employees — reporter Clive Goodman and investigator Glenn Mulcaire — who have already served time in jail. When police arrested Mulcaire, they seized 11,000 pages of notes, including the phone numbers of many suspected hacking victims. But in most cases the police have not yet made clear who was actually hacked. Actor Hugh Grant said Wednesday that he had been asked to testify at a police inquiry into the hacking allegations. The actor has often claimed he believes his phone was hacked by News of the World. The scandal has its roots in the tabloid's efforts to scoop its competitors with news about the royal family. Representatives of the royals complained to police in late 2005 that some of their voice mails had been hacked into. The police inquiry focused on Goodman and Mulcaire, who were jailed in 2007 for the hacking. Executives said at the time that they were the only employees involved, but that has been undermined by a series of arrests at the newspaper earlier this year and by the company's willingness to settle with other victims. The tabloid's parent company, News International, has insisted it is working closely with police and has a zero-tolerance policy for any wrongdoing or sketchy tactics. Virgin Holidays cancelled several ads due to run in the Sunday newspaper this week. Car makers Ford UK and Vauxhall and Halifax bank also said they have suspended advertising. Mumsnet — a popular online community for mothers — removed ads from Murdoch broadcaster Sky after its members complained about the tabloid hacking. Phone-hacking featured prominently on the home pages Wednesday of the Wall Street Journal, another Murdoch publication, and the paper mentioned its ties to the scandal-ridden tabloid in the fifth-to-last paragraph of a lengthy piece. The Journal's article made no mention of Murdoch himself. Murdoch's other properties — tabloids among them — did not distance themselves from the story — phone-hacking revelations were front and centre on the Sun's website and Sky news replaced its featured stories home page box with a "breaking news" banner and multiple hacking-related stories. The Sun noted, however, that rival tabloids "have also been accused of dodgy and illegal activities while pursuing stories." Robert Barr, Danica Kirka, Meera Selva, David Stringer and Cassandra Vinograd contributed to this report.